We are pleased to announce the addition of Taylor Whittle to the sales staff at Runde Ford Chrysler Dodge Jeep Ram in Manchester! Taylor, who is originally from Volga, IA, lives in Strawberry Point with his wife, Ellen. Before working here, he was a sub-contractor doing mostly roofing and siding. His favorite vehicle, other than his trusty 2001 Pontiac Grand Prix, is the Ford Raptor. 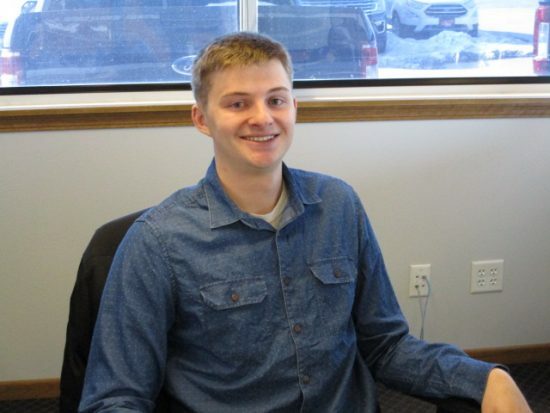 Taylor is looking forward to selling from Runde Auto Group’s large inventory of new Fords, Chrysler, Dodge, Jeep, and Ram, as well as used vehicles. In his spare time, Taylor enjoys golfing, reading, playing cards, playing board games, and spending time with his family and friends, as well as their family feline, Stella. If you are in the market for a vehicle, stop in to see Taylor! Taylor can be reached by calling (866)-580-9767 or emailing twhittle@rundeautogroup.com.